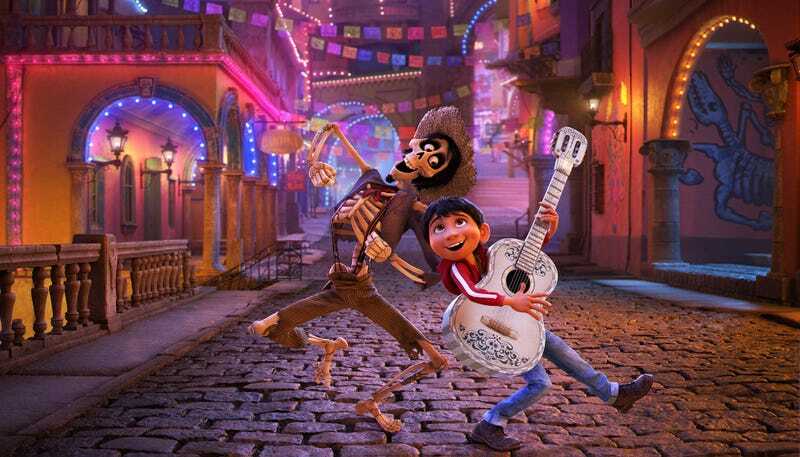 The afterlife imagined by Pixar’s new animated film Coco is a labyrinthine, luminous necropolis crisscrossed by string lights and papeles picados, a place both strange and all too familiar. Its currency is memory; its exit visas are family photos, without which the skeletal dead can’t cross the orange marigold-petal bridge between worlds to see their living friends and relatives on Día De Muertos. In the city of the dead, there are still haves and have-nots, rich and poor, bureaucrats and border agents. The deceased, we learn, are mortal, too; they die when they are forgotten by the living, fading into a greater beyond. At a glance, this musical fantasy of departed family members peering back on our world seems like an oversweet interpretation of Pixar’s sentimental themes, not to mention the perfectionist animation studio’s preoccupation with memory. (See: Inside Out, Finding Dory.) But Coco teaches a salient point: In the dead, we see ourselves. Their world bears more than a passing resemblance to ours—and to the plight of families separated by borders—because our anxieties about death mirror our worries about own lives. It’s one of a handful of challenging ideas articulated in a film that is, paradoxically, one of Pixar’s less challenging high-concept creations—a somewhat formulaic, busily animated adventure with a relentlessly tearjerking finale and a structure that brings to mind Disney’s renaissance period. Its story is told from the point of view of 12-year-old Miguel Rivera (Anthony Gonzalez), the youngest son of “the only family in Mexico who hates music.” The Riveras are shoemakers, a trade taken up by Miguel’s great-great-grandmother Imelda more than 95 years ago, when her husband ran off to make a name for himself as a musician, leaving her alone to provide for their daughter—Miguel’s senile, wizened great-grandma, Mamá Coco. (Her significance to the plot doesn’t become apparent until much later.) Ever since then, music has been forbidden in the Rivera household, along with any mention of Miguel’s great-great-grandfather. It’s said that he was never heard from again. But Miguel dreams of becoming a musician, sneaking off in his free time to a secret crawlspace to play along to the music of Ernesto De La Cruz (Benjamin Bratt), a beloved, Pedro-Infante-esque singer and film star of the 1930s and ‘40s who died at the peak of his career, killed by a falling piece of extravagant scenery while performing his signature song, “Remember Me.” (Pixar’s tradition of parodied heroes—from Toy Story’s Buzz Lightyear to Up’s Charles F. Muntz—continues here, with plenty of out-of-context clips from De La Cruz’s movies, including one where he inexplicably plays a flying priest.) And while his family is preparing for the Day Of The Dead, the boy comes across a torn photo that suggests that his idol and his deadbeat great-great-grandfather might have been the same person. Breaking into De La Cruz’s mausoleum to “borrow” his guitar for a talent show, he is magically whisked into the hereafter alongside a mangy street dog named Dante. Once the shock and stupefaction wear off, more pressing concerns weigh in: Miguel needs to return to the land of the living before sunrise, or else he risks being stuck forever. All it takes is the blessing of family member. But it turns that out the Riveras in the afterlife approve as little of his musical ambitions as the Riveras back on Earth. So, Miguel runs off to find De La Cruz—who is as big a celebrity here as he is back in the boy’s hometown—with the help of Héctor (Gael García Bernal), a gangling scam artist who died of food poisoning and now resides in a shantytown with the rest of the undocumented dead. The dead themselves are some of the most slapstick characters to emerge from Pixar’s rigorous, on-model animation style—life-sized candy skulls with bodies of rattling bones that piece themselves back together like push-puppet toys whenever they get knocked over. Their clattering adds an element of chaos to what is otherwise a stubbornly organized film, with a third act that combines familiar Disney and Pixar tropes, including a twist that adult viewers will be able to see from a mile (or at least an hour) away. 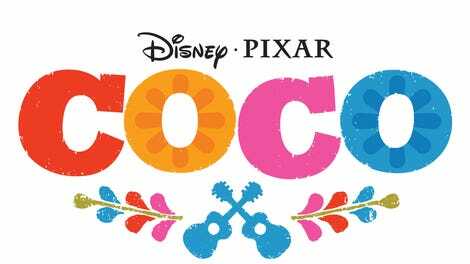 One might argue that Coco could stand to be weirder and more self-indulgent; the alternate reality it creates is entertaining and expansive. But then it wouldn’t be a Pixar film. It is impeccable, time-tested craftsmanship, not experimentation, that drives Coco, both in its most familiar beats and in its most moving moments.